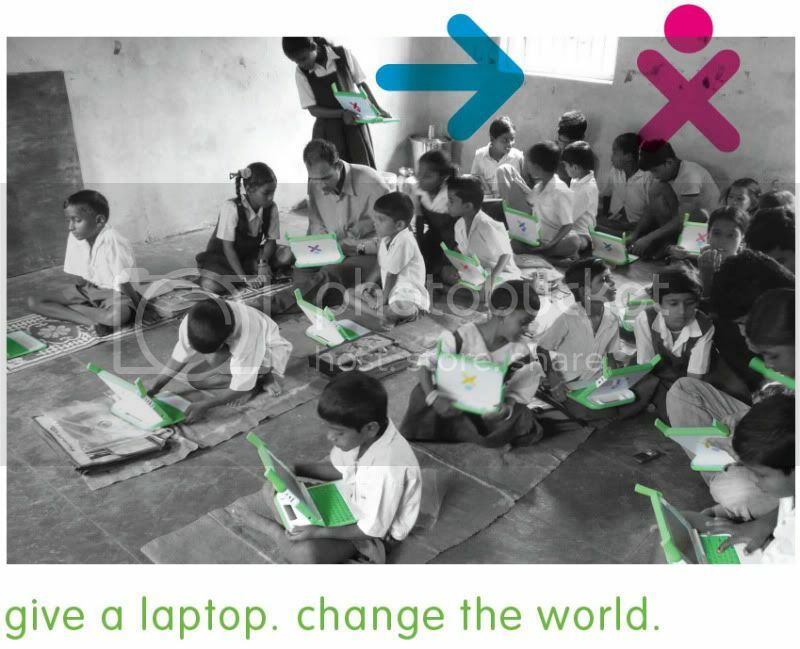 One Laptop per Child (OLPC) is a non-profit association working on a major project: improve education in third-world countries with a low-cost laptop to educate impoverished children and prepare them for opportunities in the developed world. The current model is the OLPC XO-1, it is a $100 laptop produced by Quanta Computers. The laptop uses AMD LX-Geode CPU at 700 MHZ, 256MB of RAM and 1 GB of flash memory. The laptop also contain built-in wireless network and colour camera1. 2007 The laptop becomes mass produced. Over 150,000 laptops are sold in the Give One Get One program. 2005 The World Economic Forum in Davos, Switzerland is presented with Negroponte's $100 laptop concept. 2002 20 children from a remote Cambodin village receive laptops frmo Negroponte. They could be used anywhere in the community. "Google" was their first English word. 1995 "Being Digital" establishes the seeds for One Laptop per Child's vision. 1982 Papert and Negroponte give Apple II microcomputers to school kids in Dakar, Senegal. This milestone proved Papert's central theory: kids in rural impoverished regions learn how to use computers as quickly as kids in first world countries. This pilot project was sponsored by the French government. 1967 Seymour Papert, et al. release Logo which is the first programming language designed for kids. 1. Child ownership - OLPC has created the XO laptop to be low cost, robust and powerful, beautiful and friendly. It was designed for elementary school children, the first of its kind. 2. Low ages - The XO is designed for the use of children ages 6 to 12 that covers the years of elementary school but nothing precludes its use earlier or later in life. Children do not need to know how to write or read to enjoy and learn with an XO. Playing is the basis of human learning, and the digital activities on an XO help with acquisition of reading and writing. 3. Saturation - The key point is to choose the best scale in each circumstance. It can be a country, a region, a municipality or a village, in which every child and teacher will own a connected laptop. 4. Connection - The XO has been designed to provide an engaging wireless network. The laptops are connected to others nearby automatically. Children in the neighborhood are permanently connected to chat, sharing information on the local network or web, making music together, editing texts, or using collaborative games. 2. Reference: http://laptop.org/en/vision/project/index.shtml. Added by group member Katrina Rozal. 10. Group member Katrina Rozal added videos and main photo, and did the page layout & general copy editing.